China is famous for its long history as well as its yummy cuisine. It mainly consists of eight cooking styles, including Sichuan, Shandong, Hunan, Anhui, Cantonese, Fujian, Jiangsu and Zhejiang cuisines. Snack streets gathered both fine dishes and tasty snacks. Some of them feature local specialties and foreign snacks; some combine dinning and shopping, turning the street into a fashion center of the city; and yet others stand out for their snacks and tourist attractions, boasting a variety of famous historical sites. The 550-meter-long street combines dinning, traveling and shopping. The buildings were built in Qing Dynasty style, boasting numerous restaurants, bars and souvenir shops. Famous traditional snacks like lotus leaf harrow, Sichuan noodles with peppery sauce and hotpot are easily found here. Various kinds of cultural events form regular highlights along the street, including the Double Seventh Festival (the traditional Chinese Valentine's Day). In 2006, it was named a "National Demonstration Base of the Cultural Industry" by the Ministry of Culture. 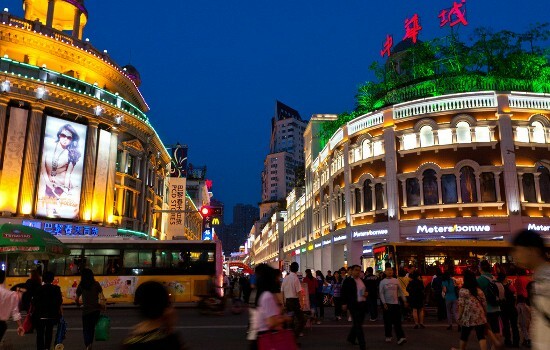 Zhongshan Road is the most popular street for dining among residents as well as a must-see attraction for visitors. The less than 1000-meter-long street boasts numerous traditional refreshments, including seafood, sesame paste, glue pudding and wontons. It has also gathered the snacks of 10 countries of the Association of Southeast Asian Nations ever since the China-ASEAN Expo settled down in Nanning permanently. Various kinds of imported fruits are easily found along the street. 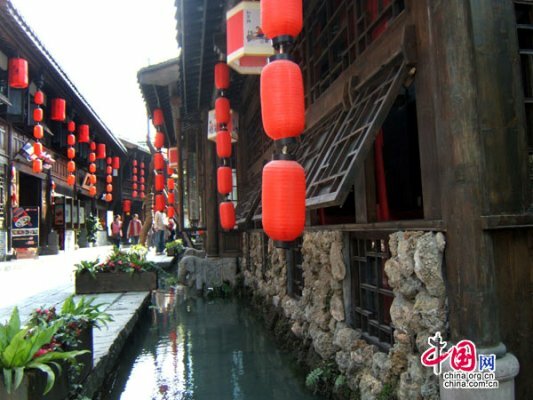 The 6-acre-wide Sifang Street is the heart of Lijiang Ancient Town. It was a commodity trading places in ancient China. Built in the early Yuan Dynasty (1271-1368), it has more than 800 years of history. The street features harmony multicultural images because it has several ethnic groups in the region, including the Bai, Nakhi and Tibetans. The narrow street boasts dozens of restaurants on both sides and almost each one features the local snack of the province -- Yunnan rice noodles. Located in Ziyou Road, Wuchang District of Wuhan City, Hubu Lane is one of the most famous streets in Wuhan with over 400 years of history. The 150-meter-long street is crowded with various kinds of suppliers, including snack stalls, shopping booths and entertainment venues. 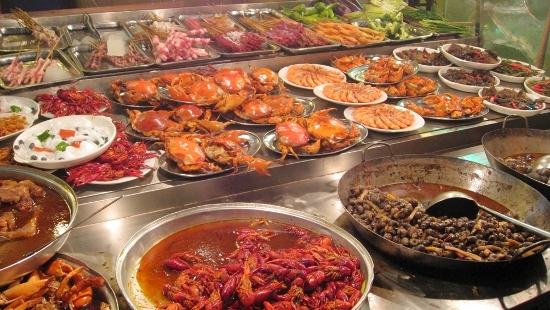 It has become Wuhan's official snack street, containing 160 stores that sell 170 types of breakfast foods and snacks. You can try some authentic Re Gan Mian (hot-and-dry noodles), fried tofu skin and shaomai (steamed pork dumplings). 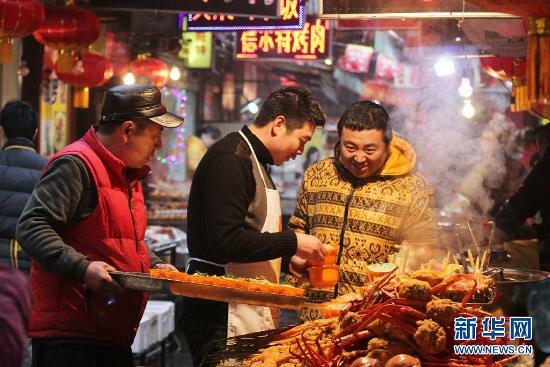 Located in Dongzhimen, Chaoyang District of Beijing, the nearly 1-kilometer-long street is filled with different cuisines on both sides, including the Sichuan, Hunan, Guangdong and Shandong cuisines. It is called "Ghost Street" because of the ghostly spectacle of the lined-up lanterns. Moreover, many restaurants stay open until early morning, ensuring the street never sleeps. Staple dishes are spicy prawns and sautéed bullfrog in chili sauce. 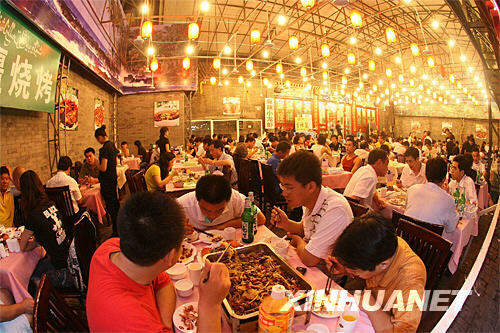 Famous restaurants include Hu Da, Jingui Xiaoshancheng, Xiao Yu Shan and Little Sheep. Pichaiyuan was well known in the 1930s and 1940s as a food street and also as a venue for traditional folk culture. In 2008, the street was reopened after being restored in 2007. 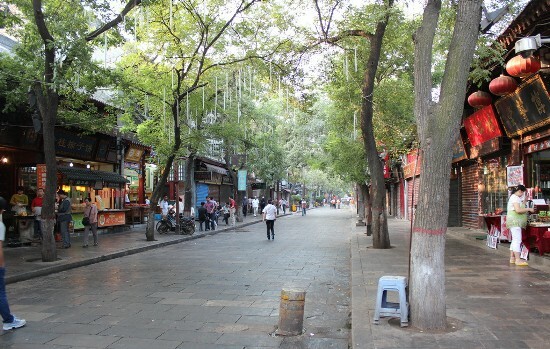 The rebuilt Pichaiyuan features old-style streets and buildings. Restaurants serve up specialties such as jellied bean curd, mackerel dumplings, barbecued seafood, fish with pickled vegetables and fried rice cakes. Apart from snacks, visitors can enjoy folk arts and performances, including opera, acrobatic shows and handicrafts. Built in 1925, Zhongshanlu Pedestrian Street is the oldest shopping street in all of Xiamen. The buildings are arcade-houses with pink and milky white as their main color schemes, which display the characteristics of modern times in China. It mainly offers Fujian and Taiwan snacks and seafood, including peanut soup, glutinous rice dumplings and pearl milk tea. It also hosts some great cultural events every week such as sculpture exhibitions featuring Fujian and Taiwan characteristics. The Muslim Street in Xi'an has over 1000 years in history, making it a must-see of the city. It consists of several streets, featuring strong Muslim culture. Famous snacks include the pita bread soaked in lamb soup. The area also boasts a large number of attractions, including the Hanguang Gate from the Tang Dynasty (618 - 907), the West Gate Building Groups form the Ming Dynasty (1368－1644) and many well-preserved Muslim mosques. The history of the snack street can be traced back to the late Qing Dynasty and the early Republic of China. 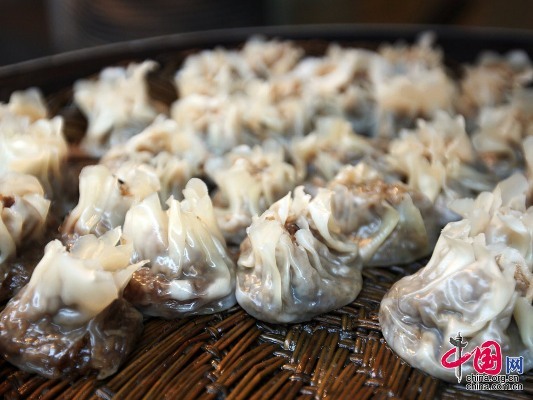 It focuses on a variety of local snacks, including traditional cakes, vegetarian buns and eight-treasure rice pudding cooked up by well-known restaurants like Song Yue Lou, Song Yun Lou and Lv Bo Lang. 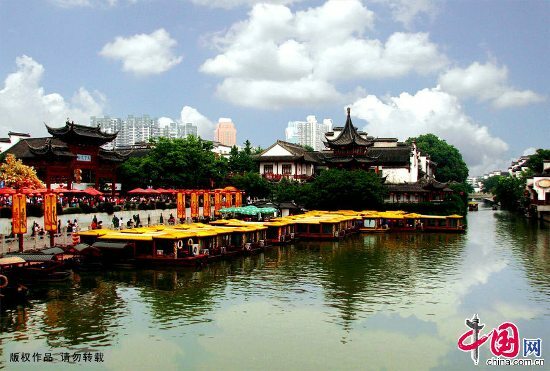 In addition, it's close to several famous attractions like the Yu Garden. Having a nice snack after visiting the attractions will really make your day. Nanjing Fuzimiao, also known as the Confucius Temple in Nanjing, is a large ancient architectural complex. 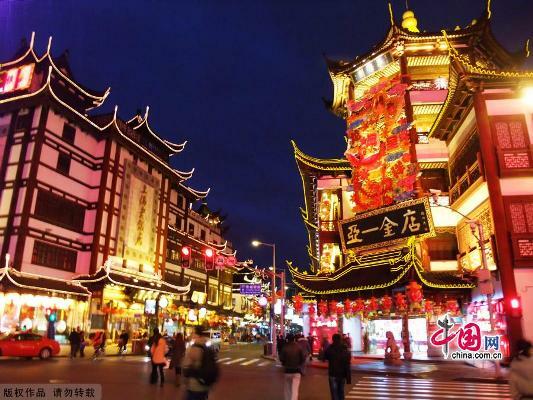 It is also the birthplace of Nanjing snacks. It has been the snack center of the city since the Six Dynasties (220 or 222–589), which carry more than 1000 years of history. 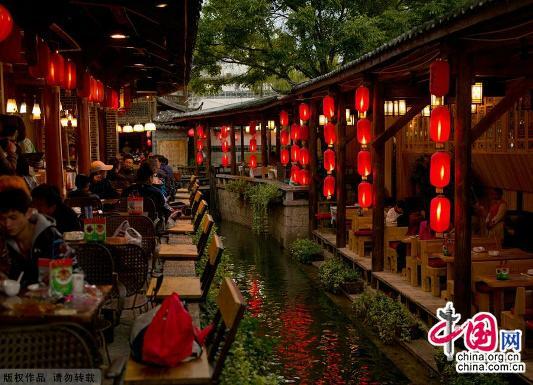 The small area owns more than 20 restaurants, including many well-known restaurants like Gui Guang Ge, Jiang You Ji and Yong He Yuan. Besides, it has two gourmet festivals every year, attracting numerous visitors.